The world of babywearing has boomed in recent years. Today, parents are recognizing not only the health benefits of babywearing but also embracing it as the lifesaver of early motherhood. The beautiful ways carriers can make a fashion statement have made it a must-have accessory in the repertoire of fashionable mothers worldwide. At Artipoppe, we are creating the world’s leading quality wraps, ring slings and soft structured baby carriers in stunning bespoke fabrics and blends that exemplify babywearing as the beneficial, yet vogue parenting choice of today. Navigating which kind of baby carrier will work best for your family and lifestyle can be a difficult decision for first timers or parents who want to try something new. There’s the traditional woven baby wrap that is famous for versatility, the ring sling that is a stylish favorite, and our newest addition to the collection — the soft structured baby carrier. In this guide, we will explore the ultimate fashion accessory for motherhood in all three styles. Our newest addition to the collection is the Artipoppe Zeitgeist Baby Carrier. Unlike our baby wraps and ring slings, the Zeitgeist Baby Carrier has padding and buckles built in for quick, simple assembly. This is a beautiful option for parents who enjoy the flexibility of a wrap carrier but desire more structure — plus, there is no need to learn any of the tying techniques you would need for a woven wrap. Parents who prefer the Zeitgeist baby carriers are drawn to them for their ease of use and built-in support. You can hold your baby close on both your front or back (but not facing outwards), as well as be comforted by sturdy straps and buckles that are simple to adjust and get on and off. Artipoppe Zeitgeist Baby Carriers are suitable from birth through toddlerhood. This new addition to the Artipoppe collection comes in its own array of designs and blends ranging from cotton to velvet to Japanese silk. The Zeitgeist Baby Carrier is the ultimate way to keep your baby close; easily and comfortably, while being stylish at the same time. A Woven Baby Wrap is a long piece of fabric used to carry a child from infancy to toddlerhood. Depending on the age of your child and your experience with babywearing, woven wraps can be used for a variety of carrying positions like front carry, hip carry and back carry. Artipoppe wraps come in different sizes, with lengths ranging anywhere from 2.7 to 5.2 meters (9 to 17 feet) in length. Artipoppe Woven Wraps also come in a wide variety of fibres and blends — everything from breezy seaweed to supple cashmere and warm qiviut, including even the traditionally soft and easy-care cotton. Each specialty blend provides varying levels of support, with some blends specially made for warmer and cooler climates or weight of your child. 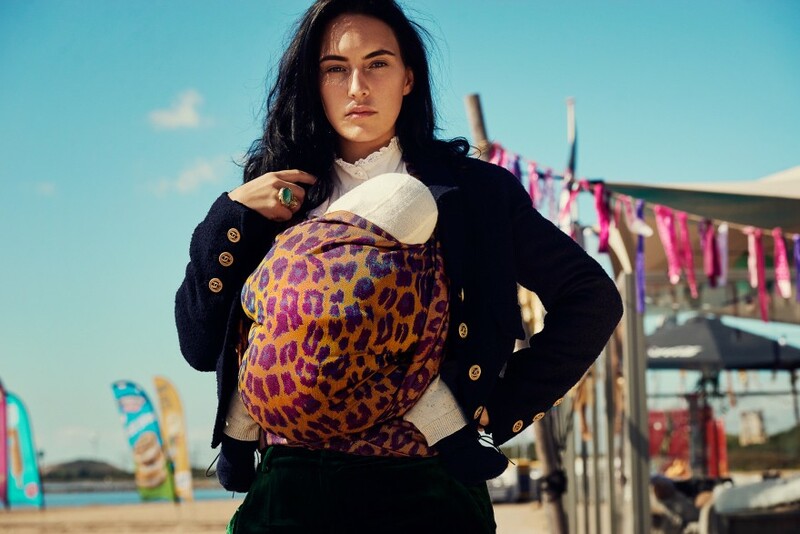 Many wraps are suitable for carrying newborns and heavier babies or toddlers, usually up to around 20 kgs or until the parent and baby are still comfortable, such as the Leopard Mania or Argus Harvard from our collection. Each woven wrap is carefully made with style expression, quality fibres and babywearing luxury at the forefront of the design process, making our wraps often to be considered each product a piece of Art. The advantages of using a woven wrap over other carriers are the versatility, support and weight distribution it provides the wearer. Woven wraps are also often selected for their naturally beautiful and minimalistic aesthetic. They are the only baby carrier which can be used comfortably from birth through toddlerhood. Artipoppe Ring Slings are one shoulder baby carriers that are one-size-fits-all. Artipoppe Ring Slings are made out specially designed woven fabric with a pair of rings (either silver or gold) sewn to one end for ease of use. Like our woven wraps, ring slings are completely adjustable and can be used from infancy through toddlerhood as a front, hip or back carrier. The ring sling is very easy to use and quick to get on, with many parents preferring it for its practicality. Unlike a woven wrap, you can leave the ring sling pre-tied for easy ups and downs. Although, at first, some find it more difficult to learn the proper carrying technique with a ring sling compared to a woven wrap. Newborn parents also tend to love ring slings because they are great front carriers for tiny bodies, and they provide both ease and cover for breastfeeding. However, when carrying a newborn in a ring sling, the safety procedures should be strictly followed. While the ring sling can be used for toddlers as well, the one shoulder carrying position can become heavy for some parents. At Artipoppe, all of our standard collection products come in either a woven wrap or ring sling. You have our full line of specialty blends, colors and designs to choose from at your fingertips wherever you are in the world, exclusively in the online shop. Whether choosing for a versatile woven baby wrap, a deliciously stylish ring sling, the effortless Zeitgeist Baby Carrier, or all – you and your baby will surely discover the many lasting benefits that come from wearing your baby, your most precious jewel. DISCOVER more about the bespoke fabrics of Artipoppe and how to build your babywearing confidence.